Equipo Nizkor - The first testimony of the survivors of Mauthausen Extermination Camp in the Spanish courts. The first testimony of the survivors of Mauthausen Extermination Camp in the Spanish courts. 1) On 30 March 2009 Judge Ismael Moreno, of Central Court of Investigation No. 2 of the National Court, took the testimony of two Spanish survivors of the extermination camp Mauthausen as part of the proceedings prepared by Equipo Nizkor instituted on behalf of victims and relatives of victims of National-Socialist concentration camps. This is the first time in over 60 years that Spanish victims of National-Socialism have testified in Spanish jurisdiction. 2) The first of the survivors to testify before the judge was Mr Jesús Tello, deported from the French city of Angoulême with his father, mother, five brothers and a sister in the train now known as the "Convoy of the 927" due to the number of Spaniards who were deported in that train. The convoy arrived at Mauthausen on 24th August 1940. Jesús Tello and his father entered the camp with more than 400 Spaniards. The remaining members of his family were held on the train and after a difficult journey of 17 days were taken into Spain. 3) The second of the survivors to testify was Mr Ramiro Santisteban, a party in the lawsuit. 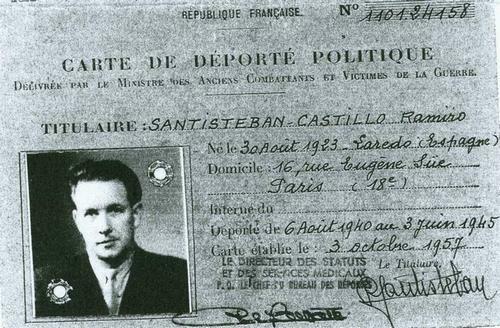 Ramiro Santisteban arrived at Mauthausen on the 6th August 1940 on the train carrying Spanish prisoners of war of different ranks previously selected from prisoner-of-war camps in Germany. He also arrived at the camp with his father. 4) The testimonies of these two individuals were chosen by Equipo Nizkor because they represent two distinguishable criminal types: in one case there is a prisoner-of-war and a clear violation of the laws and customs of war in effect at the time, constituting, at the very least, a war crime; and in the other case, pertaining to a minor, there is clearly the commission of crimes against humanity. No doubt whatsoever exists that the purpose of Mauthausen camp was extermination and that various means were used to eliminate its inmates. 5) The two witnesses were questioned by one of the lawyers for Equipo Nizkor, Antonia Macias. The questions were designed to show that Mauthausen was an extermination camp, that the SS Totenkopf were in charge of and responsible for the camp and, in addition, that they used a methodology of systematic extermination. To confirm the methods of killing that were used in the camp the witnesses were shown 15 photographs reflecting killings that had occurred there as compared with the methods of extermination described in the so-called "Cohen Report". The conclusions of this report were evidence admitted at the International Tribunal of Nuremberg and therefore the methods which the witnesses identified constituted ratification of facts already proven in that Tribunal . The lawyers present at the testimony on behalf of the private accusing parties (there are currently 18) were: Antonia Macias, Miguel Ángel Muga and Antonio Segura. Also present was a lawyer Javier García, representing another accusing party (known under Spanish law as "acusación popular"), the Fundación Acción Pro Derechos Humanos. 6) The Justice Ministry, represented by Prosecutors Pedro Martínez Torrijos (who was present during both testimonies) and Juan Moral de la Rosa (who was present at the testimony of Ramiro Santisteban), asked only a limited number of general questions concerning what took place at the camp. They did not at any time seek a positive identification of the defendants in the case as, given the type of crimes involved, such question would make no sense procedurally. Neither did the judge ask any similar question. 7) For the legal representatives in the case, the testimony given was productive as the witnesses, despite their age, offered a lucid and systematic description of the events corroborating the facts already proven in the case. 8) Although we informed members of the press who were present at the National Court that we did not agree with media treatment which the case has received since its commencement, certain statements were made and reproduced in various media which, in some cases, are absolutely false and in others, demonstrate a complete lack of knowledge as to the nature of the proceedings and the crimes committed by the National-Socialist regime and in particular by the SS Totenkopf. a) The newspaper El Mundo, signed by Joaquín Mando on Monday 30 March 2009 which states "But they were unable to physically recognise the members of the SS, images of whom were shown to them in photographs from more than 60 years ago". b) The newspaper El País, signed by J. Yoldi on 31 March 2009 which states "However, neither Santisteban - who said it was an important day to remember and to honour those dead comrades who were not as lucky as he had been - nor Jesús Tello, aged 85, who also appeared before Moreno as a witness, recognised any of the four accused as prison guards in charge of them during their imprisonment in Mauthausen". c) The newspaper ABC, signed by "S.N." and published on 31 march 2009 which states "Neither of the witnesses could recognise photos of camp officers". 10) Statements that photographs of the four accused, Johann Leprich, Anton Tittjung, Josias Kumpf and Ivan (John) Demjanjuk, were shown to the witnesses are simply false and the statement that they were shown photographs of "camp officers" is also patently false. 11) We do not know if there is a source for such information, but it is clear that it could not come from the prosecutors who were present during the testimony of the witnesses as they know perfectly well what happened there and what photos were in fact shown to them. This kind of information can only be understood to constitute an unequivocal defence of the interests of the accused and is undoubtedly intended to create a climate of opinion that would facilitate the closing of the case- for which de-legitimisation of the evidence would be necessary. 12) The only photographs seen by the witnesses were shown to them to enable them to explain the different methods used in the camp to carry out the extermination of the prisoners and they were shown by Antonia Macias during the testimony of Jesús Tello and by Miguel Ángel Muga during the testimony of Ramiro Santisteban. 13) The 15 photographs exhibited during the said testimonies come from the archive of Equipo Nizkor. It is important to point out that among the material catalogued in the Mauthausen camp records held at the United States National Archives and Records Administration (NARA) are original camp photographs collected by the Spanish news photographer Francois Boix and which are incorporated into an Archive known as the "Francois Boix Photographic Collection". 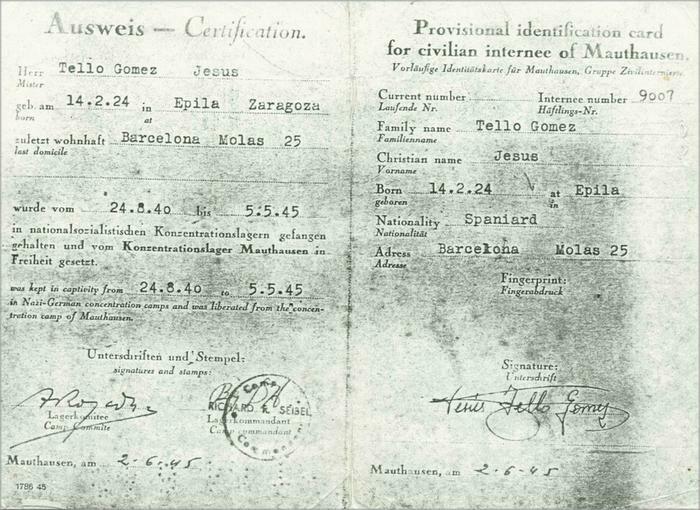 Francisco Boix was assigned to work in the "Identification Section" of the camp�s political department (Politische Abteilung), and, together with the Spaniard Antonio García, worked in the Erkennungsdienst (the camp photographic laboratory) as a clerk processing photographs taken by SS personnel. Boix was able to steal over 2000 small Leica negatives, selected to document camp conditions and official visits as well as executions and other atrocities at Mauthausen. These were hidden in various places until the camp's liberation in May 1945. The young Spaniards which made up the Poschacher Kommando, of which Jesús Tello and Ramiro Santisteban were members, managed to get a collection of photographs out of the camp with the co-operation of an Austrian civilian, Anna Pointer. Thus they were able to preserve the graphic evidence which was later used as evidence for the prosecution in the Nuremberg Tribunal by the US and French prosecuting authorities (Exhibit RF-322, RF-332 and RF-333 in the Tribunal). Boix was called as a witness before the International Military Tribunal on 28-29 January 1946 (see pp40-46 of the complaint). These photographs were important in documenting graphically the atrocities committed in the camp. They were used soon afterwards in the main Mauthausen Concentration Camp Trial between March and May 1946 before a US military tribunal, the case known as U.S. v Hans Altfuldisch et al. (pp 46-48 of the complaint and documentary exhibit no. 7 thereto). Thirty of the photographs which were rescued by Boix�s actions were submitted as Prosecution Exhibit # 153. Photostatic copies of these are catalogued at the NARA (box 11A, RG 153 location:270/1/14/07). The original photographs are catalogued as RG 549 (Box 345). This series of photographs constitutes irrefutable evidence and it is for this reason that we used some of them to complement the questions asked of the witnesses with reference to the methods of extermination used by the SS Totenkopf in Mauthausen Camp. At the request of the judge these photographs have now been submitted as evidence in the case. 14) The evidence submitted in this case shows that it has been proven beyond reasonable doubt that the four accused were members of the SS Totenkopf. The evidence used is legally valid per se, that is to say, the source of the evidence is either legal proceedings which has therefore passed the principle of contradiction or archives which certify to its legal validity. This and indeed all the evidence submitted in support of this case was without exception ratified by the US Department of Justice in its response to the rogatory commission it received from the investigating judge (see Section IV of the complaint). 15) In investigations concerning the commission of war crimes and crimes against humanity it is well known that, as a general principle, survivors will not be able to recognise the perpetrators of the crimes and that evidence of their commission is adduced by means of documentation to prove the chain of command and/or the membership of the accused in the criminal organization which planned and carried out the alleged crimes. If this were not the case, in a situation were no-one survived an extermination camp it would be impossible to bring legal proceedings against those responsible. Therefore, in crimes of this nature the witnesses complement the documentary evidence of the intent (mens rea) of the perpetrators and is useful in explaining the methods used and the context of the events. 17) Certain press information such as that published (and signed S.N.) in the newspaper ABC took the witnesses' statements deliberately out of context when stating �"the two victims admitted that the guards did not have any identification on their uniform("the Totenkoff (sic.) did not display their names (on their uniforms) but they all killed, their only objective was to kill" stated Tello)"�. It is well known that it is a violation of mandatory norms of International Humanitarian Law that military troops do not carry identification in prisoner-of-war camps, and therefore the fact that the SS Totenkopf bore nothing other than the skull and crossbones insignia, is hardly surprising given the conduct of that criminal organization and merely constitutes another incriminating element of their crimes. Any other interpretation of this can only be made in bad faith or in complete ignorance of international humanitarian law and of the proven facts set out in the judgements of the Nuremberg Tribunal, the observance and significance of which must be respected by the Spanish courts pursuant to the judgement in the Supreme Court in the case of Adolfo Scilingo [STS (Sala de lo Penal) No. 798/2007, 1st October 2007]. 18) Another distortion in the press coverage is the failure to mention that of the four accused in the proceedings only two worked at Mauthausen, Johann Leprich and Anton Tittjung. Josias Kumpf served in Sachsenhausen and Iwan (John) Demjanjuk is accused in the proceedings with respect to his service in Flossenbürg, although evidence exists of his participation in crimes committed in Sobibor. In all cases the evidence of the events which took place in these extermination camps and the criminal purpose of the SS Totenkopf constitute proven facts and are therefore not refutable procedurally or substantively. Furthermore, the Public Prosecutor of Munich (Germany) has now issued an arrest warrant for Iwan (John) Demjanjuk in respect of acts carried out in Sobibor and this warrant is based on the identical evidence originating from the identical source as that used in the current proceedings before the National Court. 19) In addition to the evidence submitted to the Nuremberg Tribunal and considered by that court in its Judgement, a US Military Court also tried those responsible for the National-Socialist camp of Mauthausen in the so-called "Dachau Trials". The US prosecutor William Denson brought charges against 61 defendants. The trial ended on 13th May 1946 and all the accused were convicted. The case is known as "US. v. Hans Altfuldisch et al.". The US Court concluded that the horrors perpetrated in the camp were known to all personnel assigned there in whatever function and that they were all therefore criminally responsible. "The Court finds that the circumstances, conditions and the very nature of the Concentration Camp Mauthausen, combined with any and all of its by camps, was of such a criminal nature as to cause every official, governmental, military and civil, and every employee thereof, whether he be a member of the Waffen SS, Allgemeine SS, a guard, or civilian, to be culpably and criminally responsible. "The Court further finds that it was impossible for a governmental, military or civil official, a guard or a civilian employee, of the Concentration Camp Mauthausen, combined with any or all of its by camps, to have been in control of, been employed in, or present in, or residing in, the aforesaid Concentration Camp Mauthausen, combined with any or all of its by camps, at any time during its existence, without having acquired a definite knowledge of the criminal practices and activities therein existing. "The Court further finds that the irrefutable record of deaths by shooting, gassing, hanging, regulated starvation, and other heinous methods of killing, brought about through the deliberate conspiracy and planning of Reich officials, either of the Mauthausen Concentration Camp and its attached by-camps, or of the higher Nazi hierarchy, was known to all of the above parties, together with prisoners, whether they be political, criminal or military. 20) Given the foregoing, we believe that there is ample evidence for the Investigating Judge to issue an international arrest warrant so that the US authorities hand over the accused individuals, particularly given that their procedural status (they have all been denaturalised and are subject to removal orders) within the US does not allow for the process of extradition. This document has been published on 06Apr09 by the Equipo Nizkor and Derechos Human Rights. In accordance with Title 17 U.S.C. Section 107, this material is distributed without profit to those who have expressed a prior interest in receiving the included information for research and educational purposes.